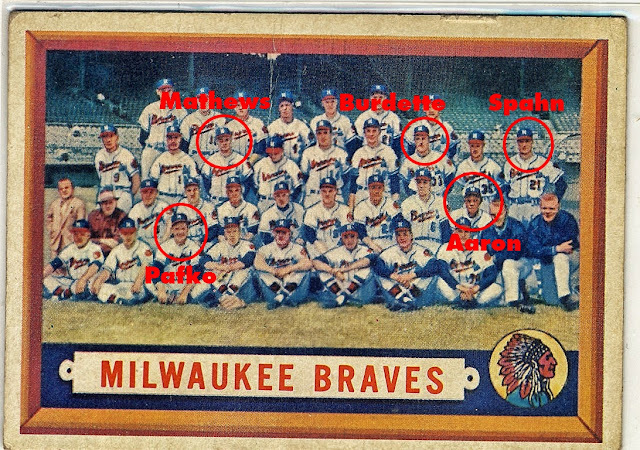 When I was working through my Andy Pafko needs lists I completely spaced on Andy possibly being in the Cubs, Dodgers, and Braves team photo checklists. But some of the Braves checklists are a little pricey based on a player named Hank Aaron. These vintage team photos are great as you get personal favorites [Andy Pafko and Lou Burdette] as well as all-time greats [Hank Aaron, Warren Spahn, and Eddie Mathews] all on one card. The quality of the team photos are not the greatest so using the photo guide on the reverse I've marked the key players. Although I have looked at this card many times it was only as I was identifying the players that I finally noticed that one Braves player isn't actually looking at the camera. It's not quite the Billy Martin "middle finger" photobomb but you've got to figure this was intentional. The player in question is Toby Atwell who played for the Braves for 10 games during the '56 season. It would also be Atwell's last games in the majors. That's pretty cool. I wonder if he was just tired of standing up there for the 12th 'take' but your theory seems plausible. He just looked down for the fun of it. 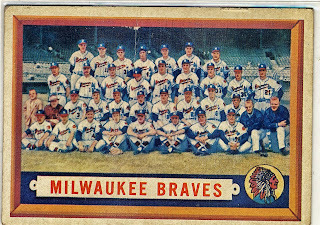 I like the team cards when they didn't just crop out the background like the '59 and many other sets. Seeing the stadium adds to them in the '57 set.